Here are some photos from our epic journey around The Galilee in Northern Israel. Enjoy, and feel free to add your comments. I've been meaning to set out some details of the 2016 Appeal for the Nazareth EMMS Hospital. 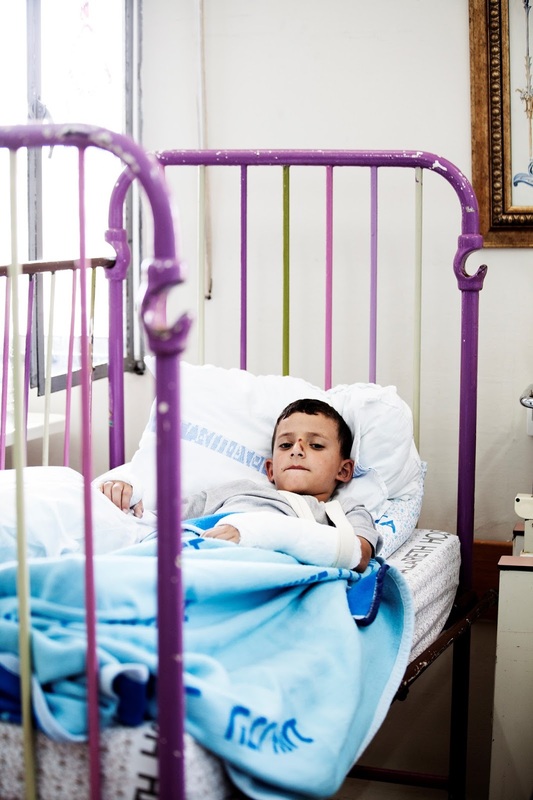 This appeal is to refurbish and rebuild the Paediatrics Department in Nazareth - an absolutely vital service for the people of the Galilee region. 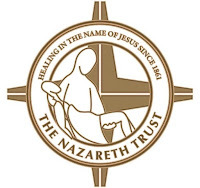 The following information has been supplied by the Nazareth Trust. Don't forget to donate at http://justgiving.com/shanenaz2016 and make sure you spread the word on Facebook and Twitter! The total population in Nazareth is 74,620. In the past, the majority of the population in Nazareth was Christian, but today the majority is Muslim. Over the years life expectancy has increased which has led to an increase in chronic diseases. The Nazareth Hospital is licensed and accredited by the Israeli Ministry of Health. It follows and abides by all the regulations and standards of the Ministry of Health. The Nazareth Hospital does not receive regular government subsidies for capital investment in buildings, equipment, and other major improvements. Neither do we have foreign donors who regularly contribute large amounts to our efforts. When it comes to capital development and purchase of equipment, Nazareth Hospital relies totally on gifts and grants from friends around the world. In October 2011, the Nazareth/EMMS Hospital officially took on the role of a teaching hospital and opened its doors for the first group of medical students from the Galilee Faculty of Medicine affiliated with Bar Ilan University. Seven of the Nazareth Hospital EMMS departments are recognised for the school’s residency programme. The Nazareth Hospital provides health services to a catchment area of 264,000 in the North. Over 40% of the target population is under 18 years of age. The paediatrics department at the Nazareth Hospital was established over 40 years ago by a missionary doctor who recognized the importance of developing and expanding services for children, including community-based health outreach to raise the awareness of mothers regarding child health. Today the Nazareth hospital runs a very dynamic pediatrics department and a Neonatology department. With 18 hospital beds, a very dedicated team and despite the very limited space, the pediatrics department houses multiple services including general pediatrics, surgery, orthopedics, urology and plastic surgery and often times gynecology services for children. It is also important to mention that the Nazareth hospital provides unique services in the region including treatment of burn patients and is the only hospital in the region that is certified by the Ministry of Health to treat and provide vaccinations for children who suffer from allergies that could compromise their condition when they are vaccinated for childhood diseases and require special attention and treatment. The paediatrics staff applies the hospital’s biopsychosocial model, considering every aspect of the children and youth who come to them for care. The social worker and other multidisciplinary teams are available to intervene when needed. Today, in spite of the department’s crowded physical conditions, patients and their families still prefer to come to the Nazareth Hospital because of the positive and supportive environment provided. The Nazareth Hospital has the only psychiatry department in the area with Palestinian staff who speak Arabic, making it much easier for Arabic speaking patients to express themselves clearly to health professionals. The final beneficiaries of this project are the children and youth who will be better provided with immediate care. In 2015, 2,162 patients were admitted for hospitalization spending a total of 3,638 days in hospital. This is in addition to our out-patient and ER clincs. Be positioned for accreditation as a paediatric training program to support the hospital in its role as center for Family Medicine residency training. This outcome will be measured by the number of resident doctors in pediatrics, measured against baseline data. Improve access to high-quality paediatric medicine. This will be measured by the number of children treated in the new facility, as counted against baseline values for that statistic. Increase available square footage dedicated to the comfort of patients and their families and caregivers. The new department will have a place where children can do homework, play, and receive family visits with some privacy. This can be measured by square footage gained. Additional emotional and psychological comfort, although qualitative in nature, can be evaluated through patient feedback. Increase the number of its staff with advanced technical skills and relevant professional expertise. This will be measured by tracking the number of staff trained in relevant paediatrics update courses as part of this project. There is a fairly sizeable pricetag on the plans. The overall total to rebuild the entire Paediatric Unit will be in the region of $3.8M in the long term, which is a LOT, and assistance will be sought from elsewhere to help bring the plan forward. However everything you give will help, and you will know that you are helping the kids of Nazareth to move to a brighter future. 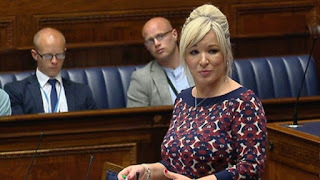 On Tuesday the Northern Ireland Health Minister Michelle O'Neill will announce her response to the eagerly-anticipated Bengoa Review into the configuration of Health and Social Care Services in Northern Ireland. This will be a BIG DEAL for those of us working in the HSC, and a BIGGER DEAL for our patients (i.e. everybody). Before anyone counters that this is yet another review of the HSC and the other reviews haven't had any effect, it's worth injecting a little context. Back in 2014 the then Health Minister Edwin Poots asked Professor Sir Liam Donaldson to report on the state of the NI Health Service. That report was called "The Right Time, The Right Place", and pointed out a number of factors that make health and social care difficult in NI, others that make it excellent, and yet more that provide an opportunity to make it even better. I'm talking things up a little - there are major reasons why the status quo for the NI HSC is not sustainable, and transformation is critically important. Everyone knows this. The Donaldson report made a number of significant recommendations, the first of which was the establishment of an international expert panel to review the Health Service and recommend a redesign that all political parties would be expected to sign up to in advance. I feel this was a pretty big ask, and therefore when a subsequent Health Minister, Simon Hamilton, took office, he reconfigured this recommendation into a combination of local, national and international experts, chaired by Prof Rafael Bengoa, to carry this recommendation forward. There was no political advance buy-in, but I don't think anyone finds that too surprising. This is Northern Ireland, but even if it hadn't been, politicians don't like signing up in advance to something they haven't had a chance to look at. The important thing however is that the Bengoa Review exists as a direct consequence of the Donaldson Review, and it would be wrong to see it as "yet another report". I've previously blogged a little bit about this, but in advance of the report itself, it would be wrong to get too bogged down in hoped-for details. That said, the word on everyone's lips is Transformation. We have to transform the HSC to achieve the so-called "Triple Aim" - better healthcare, better health, lower cost per capita. This means getting patients much more involved in their own care, changing how we deliver services, being much more open in how we share information and resources, centralising some services where appropriate, shifting expensive acute services to a small number of specialist sites, slashing clinical errors, reducing medication harm, taking a rigorous evidence-based approach to management, supporting much more care in community settings, etc. There are a number of ways we will need to do this, but it seems very likely that the Minister will announce digital technology as a key feature. At least that is what I very much hope. We cannot truly transform our HSC by tinkering at the edges and redesigning a few forms and processes. We need to make sure all staff and patients are on the same page with regard to the data, that we are minimising risk due to miscommunication across care domains, that we are saving time and risk by not requesting and re-entering the same data multiple times into multiple disparate systems. We need our patients to be able to contact and communicate with us using video and audio calls. We need them to be able to access their own data and manage their own conditions insofar as that is appropriate. This can't be done without the technology, but implementing that is a people process more than a tech process. The next few years are going to be challenging, but the clinical/professional community and our patients/clients are definitely up for it. Previously we helped build this modern operating theatre. 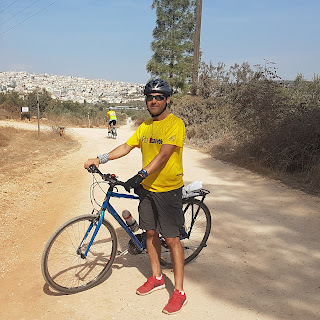 I will join friends from the UK and Middle East to raise money for the Nazareth Hospital Paediatric Department by cycling round the north of Israel. This post contains some information about me and my ride – feel free to share and to get in touch. Most important of all, I would love you to donate to our appeal – your support is greatly appreciated, and will help us achieve our dream of a modernised Paeds Unit in this amazing little city! 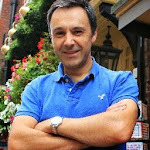 I’m Dr Shane McKee, a consultant in Genetic Medicine at Belfast City Hospital. My job involves the diagnosis and management of children and adults with rare genetic disorders. Some of the work is very hi-tech, involving the latest DNA techniques and computational analysis, but the most satisfying bit of being a Genetics doctor comes down to listening to patients and their families, putting together the pieces of the puzzle, and applying that knowledge to make life better. Children are disproportionately affected by rare genetic disorders, and when kids are ill, they need the best care, with their families around them. What is the Nazareth Hospital? Back in 1861 a young Armenian doctor named Dr P.K. Vartan from Constantinople, capital of the Ottoman Empire, arrived in the Palestinian town of Nazareth. He established the only clinic between Beirut and Jerusalem, catering for people from all around the Galilee and beyond. Although well known as the boyhood home of Jesus, Nazareth in the 1860s was a fairly small town. Over the decades, and through considerable turmoil in the region, the hospital expanded and modernised as best it could, supported by the Edinburgh Medical Missionary Society, the organisation that had originally trained Dr Vartan and which had sent him to Palestine. Today the Nazareth Hospital (known locally as the English Hospital as well as the Scottish Hospital) is a modern facility, acting as the District General Hospital for the region of the Galilee. Although established by a Christian charity, and drawing many of its staff from the local Christian Arab population, the Hospital also has many Muslim and Jewish staff (and others), and treats patients of all backgrounds. It is a beacon for unity and peace in a region that has been marred by conflict for many years. However, several areas of the hospital are in serious need of upgrading, particularly the Paediatric Department, and that is the focus of the latest appeal by the Nazareth Trust. What is my connection with Nazareth? 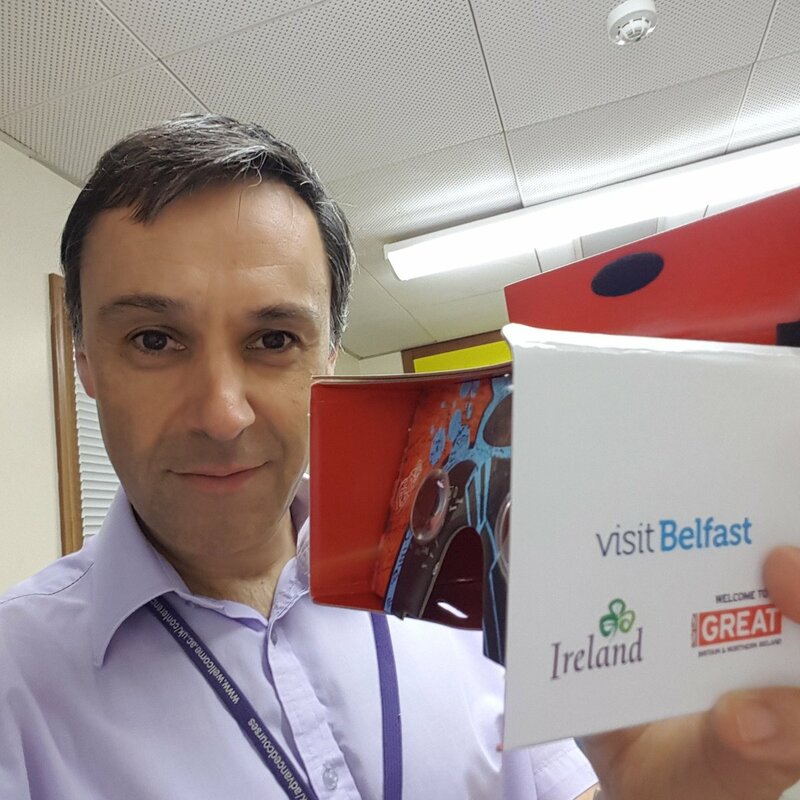 During our training as medical students, we were encouraged to travel from Northern Ireland to another country, somewhere unfamiliar, to see how medicine is practiced in conditions very different to back in Belfast. This was in 1993; I chose Nazareth, since a doctor from my home town of Dungannon, Dr Stephen Crooks, was working out there. I have always been fascinated by the Middle East, and this was an excellent opportunity to get to know a small part of it at first hand. 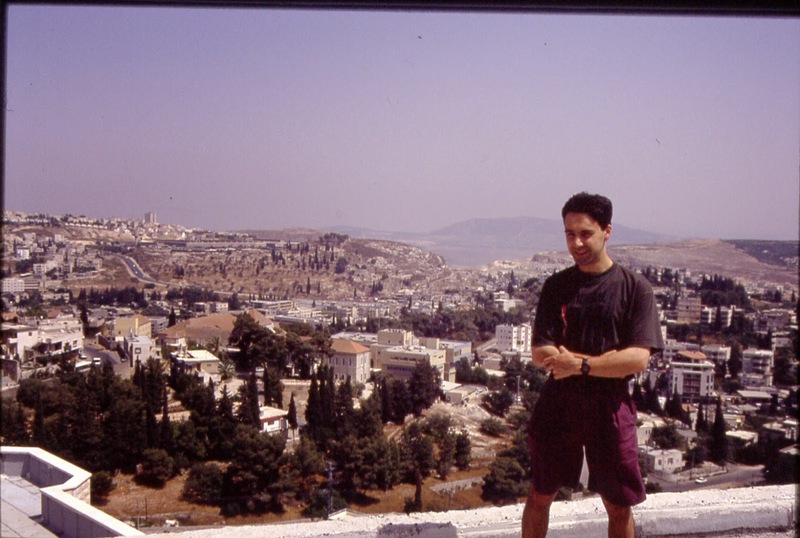 I spent six weeks training in Nazareth itself, and fell in love with this little city and its wonderful inhabitants. Although I was only there for a short time, it now feels like a second home to me. The local Arab Israeli population are warm generous people with a great sense of humour. They graciously welcomed me into their town and their homes, and that experience has shaped my entire medical career as well as my outlook on the world. As I met these people in the Emergency Department, the wards, the operating theatres, the clinics and maternity unit, I learnt a great deal about the practice of medicine, about cross-cultural communication, and about myself. I am forever in their debt. When I returned to Northern Ireland after my elective was over, I longed to return. In 2009 I joined a sponsored bike ride along the Jordan Valley, from the Dead Sea up to Nazareth. About twenty of us cycled 250 miles through Jordanian and Israeli territory, seeing the sights and feeling the burn of climbing over 1500 metres up from the valley floor to the Jordanian plateau. The proceeds of our ride went to maintaining and developing the hospital, including the new operating theatres which were a massive improvement on the very old-fashioned theatres I worked in as a student. And of course I made a lot of new friends, all of whom share my love of Nazareth. The Nazareth Hospital celebrated its 150th Anniversary with a conference in 2012 – this was a chance to catch up with old friends and to see how things have changed. Many of the kids whom I met on my first trip now have children of their own, and the Paediatric Unit does amazing work with very limited resources. From 6-10 November 2016 I am joining another intrepid group of cyclists from the UK and The Galilee (and possibly a few from elsewhere). 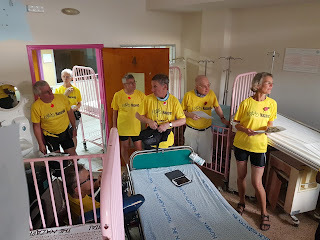 We will start in Haifa, and over the next five days we will cycle over 200 miles around Northern Israel, before crossing the Sea of Galilee by boat, and then making our way up through the hills to Nazareth Hospital. 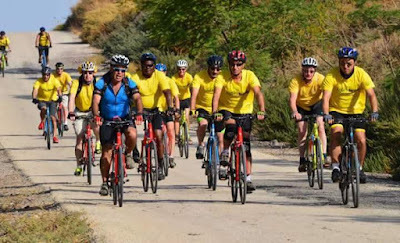 There are some challenging climbs, scary descents and bumpy tracks, as well as a couple of on-foot sections, and we’ll be overnighting in local kibbutzim at each of our stops. It won’t be easy, but it will be unforgettable (there may still be a few spaces available if anyone wants to join us!). Our objective is to raise as much money as possible to help refurbish the Paediatric Unit in the Hospital. I have set a fund-raising goal of £3000, but I hope to raise as much as I can. I have set up a Justgiving web page at http://justgiving.com/shanenaz2016 . Using Justgiving significantly reduces the administration costs for the charity (The Nazareth Trust) meaning that more money goes directly to the project. I am really grateful for any donations, no matter how small (or how big!) - they all go to making the Paediatric Unit fit for the kids of the 21st Century, and hopefully building peace for the next generation. I am of course also grateful for any publicity on FaceBook, Twitter, Instagram, media or even good old-fashioned sharing – anything to help raise as much as possible for the Hospital, and to raise awareness what we are trying to do for the children of Nazareth. Nazareth is a popular quick destination for tourists visiting Israel, but most people pass through very quickly on a whistle-stop tour. I would strongly recommend staying a bit longer, perhaps in one of the fantastic local guest houses in the Old City, exploring the town, and talking to the modern Nazarenes. It’s a complex, fascinating, full-on experience – oh, and the Palestinian food is amazing. Nazareth is famous for the best cooking in Israel, if not the entire Middle East. It is actually stereoscopic. Most YouTube VR movies are actually 2D spherical projections - you don't get a real sensation of depth. CardboardCamera is pretty smart, and stitches together its panoramas to give you separate left and right eye images. Nice. It overlays an audio track. Sound really boosts the immersiveness of the experience. It's not just looking at a boring image - even though it's still, there is still something going on. The soundtrack helps to locate you within the scene. So with all that in mind, here is a small collection of CardboardCamera images I shot in Belfast. I hope you come and visit our great wee city, and have as much fun visiting these places in reality as I did shooting them for VR! Download the panoramas - right-click, "Save link as", and copy the resultant file into your \DCIM\CardboardCamera folder on your Android phone. Then view in the CardboardCamera app. Belfast City Hall is a masterpiece of art and architecture, dating from the very early years of the 20th Century. It's well worth a visit, with regular tours of the interior. This fountain commemorates Daniel Joseph Jaffe, one of the leading members of Belfast's small but influential and illustrious Jewish community at the turn of the 20th Century. It sits in the historic heart of the city, close to the modern Victoria Square shopping centre. HMS Caroline is the last survivor from the Battle of Jutland in World War One, the largest naval engagement in history. The ship has been restored to tell the story of the battle and life at sea in the early 20th Century. It's absolutely fascinating. This is where I did my first house jobs as a junior doctor, although it's a lot quieter now than back then! The main action in the RVH takes place in the new sections. This Victorian corridor is a listed building, and contains many memories. Belfast's flagship conference and concert venue in the evening light, as the traffic rushes by on Oxford Street. The Belfast Bikes are a great way of getting around the city. Well, every city has its not-so-pretty major arterial routes, yes? Here's a Google Cardboard Camera VR pic of Dalway's Bawn, a historical Plantation cattle fortress from the early 17th Century. It can be found just outside Ballycarry, near Carrickfergus Co Antrim. The towers and frontage are spectacularly well preserved, yet this amazing piece of history is hardly known outside the immediate area of Ballycarry and Bellahill. Stubborn to the last. Jordan Valley, 2009. Nazareth is the largest Arab town in Israel, and home to its largest Christian community. Its hospital is the oldest in the country, founded by the remarkable Dr P.K. Vartan from Constantinople in the days of Ottoman Palestine. I became an honorary Nazarene when I did my elective there as a medical student back in 1993, and saw at first hand the great work being done, using healthcare to build bridges between people. The Nazareth Trust is raising money to provide much-needed refurbishment for the Paediatric Department, and a group of us are cycling through the ancient terrain of the Galilee in November 2016. Christians, Atheists, Muslims, Jews and others - all are welcome. So please go over to my Justgiving page and sponsor me! Also share on Facebook and Twitter: #shanenaz2016 - and thanks so much for your support! 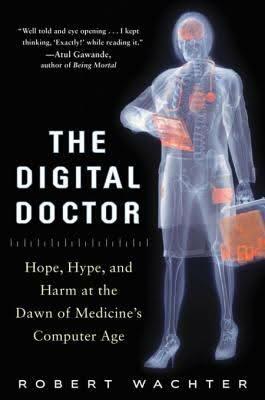 I'm currently reading Dr Bob Wachter's fantastic book "The Digital Doctor" - a hard-hitting and insightful analysis into the whole field of the computerisation of medicine. Medicine has undergone a profound transformation in the past decades, and computerisation was, in many circles, felt to be the Next Big Thing that would deliver better care at lower cost for a greater number of people. The impact of digital in other industries - and indeed in our social lives - was felt to be translatable across to the messy world of Medicine, and we'd swiftly be on our way to a new and safer healthcare world. Billions were spent on this promise, and the big IT contractors gleefully piled in to address the issue. And of course the reality was that Healthcare is much more complex than they imagined. Rather than this being a *technical* challenge, that could be sorted by wheeling in the appropriate tech and software, we are faced with an *adaptive* challenge, where the problem lies in the people, processes and indeed culture of the healthcare world. If we want to use IT to help us build better healthcare, we have to start with what is going on at the coal face. It's not enough (indeed it's positively fatal) to engage the CEOs and Medical Directors of healthcare delivery organisations (e.g. Trusts in the UK), and expect adoption and improvement to automatically follow. I'm still something of a newbie at this, despite blogging about various aspects of our Northern Ireland journey over the past few months (in between digressions into biking and virtual reality). However at a recent meeting to discuss our plans for a unified Electronic Health Record for Northern Ireland (#EHR4NI), I heard a senior decision-maker (not a clinician) actually state that the road to clinical engagement would be to speak to the Chief Executives and Medical Directors of the Trusts; this would be how we would deliver the necessary buy-in from the doctors, nurses, AHPs and others that would make the process a success. Bob Wachter's findings would very much suggest otherwise. The good news is that NI has appointed Chief Clinical Information Officers for each hospital Trust, to join established colleagues in the Public Health Agency, the Health and Social Care Board and the NI Ambulance Service. There are five HSC Trusts; Belfast is one, and I have the pleasure of being the CCIO there. However, I and my colleagues also have busy clinical jobs also, and this clearly limits what we can actually deliver. Another model might be to continue to purchase multiple "Best of Breed" solutions - software written by subject experts, and tailored as best as possible to the clinical process that we're trying to improve. Whether many of the systems we use would qualify as even mediocre, never mind Best of Breed, is debatable. And we're locked into contracts that are difficult to escape from, while our patients' data remains fossilised in systems that are reluctant to give it up again, much less to interoperate across the silos they were engineered to sit atop. It's pretty clear that this way lies madness; patient care is not markedly improved, but we end up spending a whole lot of money anyway, and digging ourselves into an even deeper hole. So let's see how we resolve this problem. It turns out that farming these important issues out to IT professionals and consultants (not the clinical type!) is a critical error because these people cannot understand the clinical world. How can they? They're not trained. Nor can we just hand over to clinicians, because without the necessary background in quality improvement, change management and multidisciplinary vision, we just end up consolidating irrational variation (based often on whim) and making decisions that end up reinforcing silos, and indeed multiplying them. We need to find ways to get all these people - clinical, IT, managerial, and (most crucially) the patients - collaborating. I'm still working my way through Bob's book (reading and re-reading each chapter - it's worth it! ), but it's reinforcing some thoughts that I and my CCIO colleagues seem to be rapidly coalescing around. One is that we need to get the Data Interoperability issue highlighted (Bob calls it "baked in") from the outset. 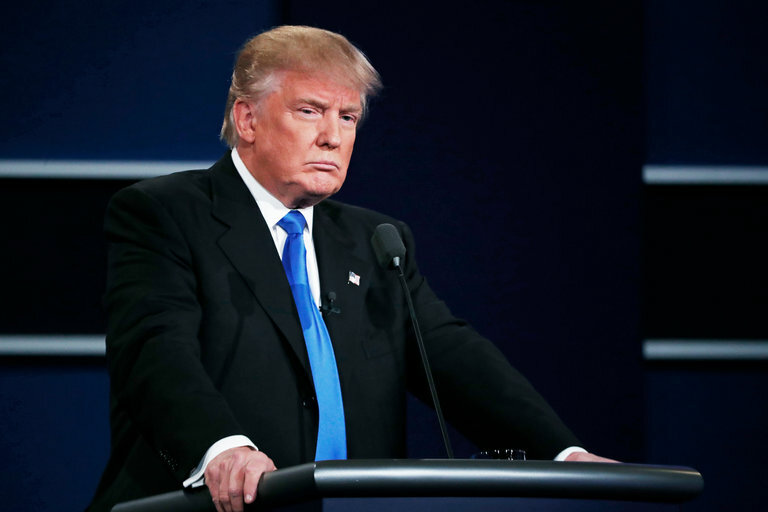 I'm going to suggest that we very explicitly and at an early stage in the process - now's good - state that we are NOT going to go down the route of a single electronic system to replace all the systems and functions of a healthcare IT infrastructure. Instead, we must create an ecosystem where the patients' data forms the core resource, and multiple developers and vendors can work on refining the interfaces that serve the clinical, management and analytical needs of the health service. In effect, this seems to imply (and I am continuing my research, so this represents my current view, which may change according to new evidence and arguments) that we address the data first, then progressively migrate the apps to the data, instead of the old ways of migrating the data to the apps. We need evolution, not revolution. Plenty of Positive Pops rather than Big Bang. What will this allow us to do? Firstly, it should encourage standardisation around best clinical practice - since we will be collecting the same data, we can assess variation, and analyse processes to see how best we can remap them to the most solid evidence base. Secondly, it will encourage innovation - agile software development will make it easier to quickly adapt interfaces to new clinical developments, without the need to change an entire system. 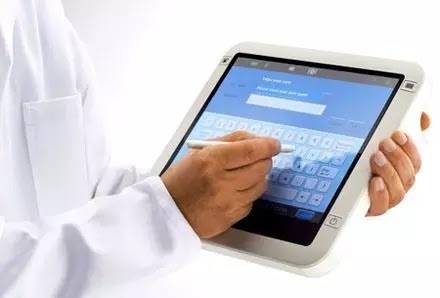 Thirdly (and as a result of these), it will allow frontline staff and patients to get much more involved in refinement of the apps and systems that are being used. Fourthly, since the apps will be using the same data according to agreed definitions, data can be reused across clinical scenarios, reducing duplication, waste and errors. Now these are very logical benefits, but will they actually pan out in practice? That is the million dollar question (or in the case of the UK's largely-failed National Programme for IT, 16 BILLION dollar question). 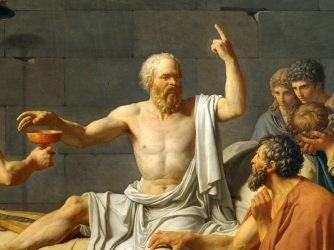 There is good reason for scepticism that all the advantages that come from magical thinking will actually appear in the short term. They call this the "Productivity Paradox" - computerisation should help, but it usually requires a long time before it actually delivers, if at all. Our budgetary decision-makers in NI need to be aware of this - if we are going to go digital, it will cost money up front that may take years to deliver a return. But let me get back to the main point - our prime objective here is NOT to computerise Health & Social Care - it is to improve the care of our patients. If we keep that principle front and centre, and build in the absolute requirements for an open and interoperable data platform supporting multiple partners, then we can do something pretty special here. One model that I am very keen on is #OpenEHR, and we are actively exploring what we can do with this approach (and I think we should be doing more). Is Northern Ireland up for this challenge? Well, before we head too far up this loanen, (old Ulster Scots term - look it up), I suggest we need to invest a good deal more resource (still cheap!) in freeing up some more of the time of the young (or at least not too senior) doctors, nurses, AHPs etc who will explore these waters and energise their clinical teams. I feel we CCIOs need significantly more time in our job plans to be CCIOs (one day a week? seriously?! ), and we need clinical colleagues funded within our organisations who will join clinical informatics groups. We also need the CCIO role beefed up in terms of where it sits in the organisational hierarchy. We need specific specialty and patient focus groups that are structured around actual delivery, rather than merely producing wordy documents. We need a workable governance framework for the data, and we need money to do the groundwork and to experiment with various implementation models. This has to involve links with academia and IT industrial partners. We need to take risks. We need to be prepared for multiple Plan/Do/Study/Act cycles, supported by rapid innovation and rigorous data analysis. And we need to be ready to put our backsides on the line. We have already had remarkable success with the Northern Ireland Electronic Care Record (NIECR) - that rare beast of an IT system that clinicians love, and that has had a dramatic effect on the practical delivery of patient care. Most hospital doctors now use NIECR as their first port of call when trying to find clinical information (letters, lab reports, radiology, medications) on patients, and it makes a real difference. It has shown us what is possible, and now we have to take things to the next level. 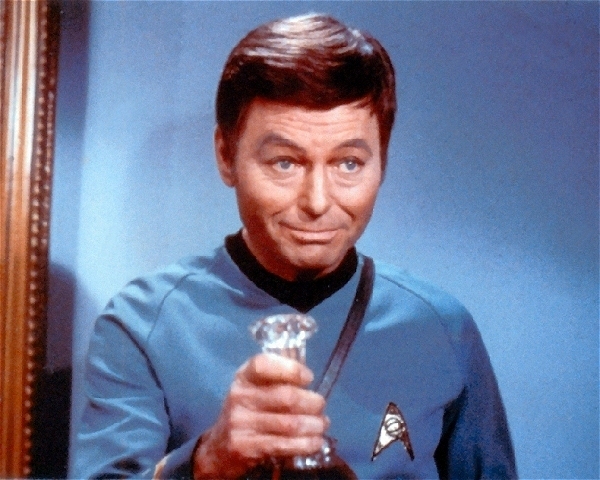 It's going to be a lot of work, but by the time Bob writes the second edition of "The Digital Doctor" (or maybe by the third - let's be realistic! ), I want Northern Ireland to be one of his shining examples of what is possible when a country gets things right. So let's make sure we do that, rather than ending up as yet another cautionary tale of what happens when you try to turn a quality improvement process into a large scale IT project. We went cycling in Slovenia. The event was the Single Speed European Championships - mountain bikes specifically modded to have only one gear setting. It's all the rage among the kids these days, and certainly imposes an interesting discipline on one's ride. Anyway, Slovenia is utterly beautiful. And of course I took my phone and captured some fantastic immersive 360 degree virtual reality images of the scenery. You'll really like this one, from the heights of the idyllic Soca Valley near the fantastic little town of Kobarid. Click here to download the vr.jpg file. Put it on your Android phone and view in the Google CardboardCamera app. Oh, and in the race I came 4th. Along with about 300 other people. There is no 5th in this race. In the short video below you'll get a flavour of events, and you'll see my brother Rick, and friends Hugh and Davy - as well as a load of new friends. And stuff. A beautiful evening in Greenisland. This is a 3D panorama for @GoogleCardboard Virtual Reality, in the vr.jpg format. It has audio and a true 3D still image. You need an appropriate smartphone (I use a Galaxy S7) and a Google Cardboard viewer (£4 on Amazon - seriously). Get ready for an amazing immersive experience - it's just like being ME beside my BIKE! Beside a ROAD and a FIELD! You'll notice that the software compresses moving vehicles into rather strange abberations, but the immersive virtual reality effect is pretty darned good. Views over Belfast - in Virtual Reality. Want to see the #VR view on my morning bike ride up Knockagh in Co Antrim? Well, with Google Cardboard, you can! Click here to download the immersive Virtual Reality file, and view it on your Android phone. (some more instructions here). OK, so here's the deal. You EITHER have to sponsor me, or sign up to come along and raise your own sponsorship. It'll be epic, and the cause couldn't be better - refurbishment of the Paediatric Unit in Nazareth Hospital. You in? I'll be posting plenty of cool 3D panoramas that you can view on your smartphone using the amazing GoogleCardboard virtual reality setup (really, everyone should get one of these). If we are to drive progress in medicine, perhaps we need to think about the distant(ish) future. If we make our projections too near-term, we allow ourselves to get shackled to the status quo, and dream too small. So, what will medicine look like in 2050? That's far enough away that we don't have to worry about how we get there, yet it's close enough that many of us will either still be practising, or may be the recipients of that healthcare.